Milan (AsiaNews) – Fr Piero Gheddo, a missionary with the Pontifical Institute for Foreign Missions (PIME), died today at the Ambrosiana nursing home in Cesano Boscone, near Milan. He was 89 years old and had been ill for some time. Internationally recognised as ‘the missionary of print media’, Fr Gheddo worked all his life in the world of communications to spread the Gospel. In 1986 he founded AsiaNews, and continued to contribute to it when it went online. Born in 1929 in Tronzano Vercellese (Italy), he attended the diocesan seminary of Moncrivello (Vercelli province). He entered PIME in 1945 and was ordained priest in 1953. His dream was to go to India, but after his ordination he was always asked to work in journalism. He often said he had repeatedly asked his superiors to let him go on mission, but without success. Still, he travelled the world like no other and he knew the missionary world in all its aspects and in all its latitudes. Convinced that the universal mission is the responsibility of each believer, he was one of the founders of the PIME missionary centre in Milan in 1961. From there, he spread culture, information and mission works in Italy and the world together with Fr Amelio Crotti and Fr Giacomo Girardi. The campaigns organised by the PIME Centre against hunger in the world, for Vietnamese and Cambodian refugees, for peace in Lebanon, for the missionary Vigil ahead of World Mission Day have marked the lives of many generations of young people. The foundation of Mani tese (Extended hands) in 1964 and Editrice Missionaria Italiana (Italian Missionary Publishing, EMI) in 1955 are part of this work. From 1959 to 1994 he was editor of the monthly magazine Mondo e Missione (World and Mission), one of the most precious tools to learn about global issues and the Christian contribution to Church building and development. 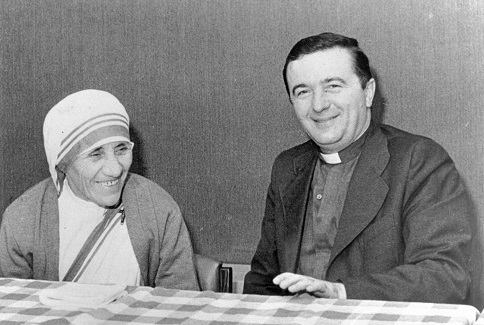 At a time of great ideological conflicts, he combined a clear ecclesial identity to openness and commitment to heal the world’s social wounds, convinced of the irreplaceable contribution of the Gospel to humanity’s full dignity. In tune with the Second Vatican Council, but rowing against the current, he was the first to denounce – after seeing it in Vietnam – the Vietcong’s violent ideology. Acclaimed by the whole world, he witnessed its oppression of the Vietnamese people. While valuing Helder Camara, the bishop of Recife – brought to Italy by the PIME Centre –, he was always critical of the Marxist trend within a part of Latin America’s liberation theology. On the subject of hunger in the world, he stepped away from the obvious complaints (colonialism, exploitation, etc.) and easy solutions (investments, technology transfers, etc.) to show that – as missionaries say – underdevelopment has a cultural dimension. In order to overcome it, education and evangelisation are necessary, to give people and their dignity a role to play in history. This balance was valued by popes as well. In 1962, as a journalist of the Osservatore Romano, he was chosen by Giovanni XXIII as an expert to draft the conciliar decree Ad Gentes. In the 1990s, John Paul II chose him to author the encyclical Redemptoris Missio. Fr Gheddo’s activity has been multifaceted. He was the editor of Italia Missionaria (Missionary Italy), whose goal was to promote an evangelising sensibility among young people, as well as Missionari del Pime (PIME Missionaries), to provide direct access to the experiences from the missionary borderlands. Father Gheddo wrote more than ninety books, thirty of which were translated, and received several journalistic awards. Deeply convinced that the world needs models and experiences, Fr Gheddo was a driving force behind the cause of beatification of a number PIME missionaries: Giovanni Mazzucconi, Paolo Manna, Clemente Vismara, Mario Vergara, and more recenlty Alfredo Cremonesi. He worked on documenting the actions of the servants of God Marcello Candia, Angelo Ramazzotti, Felice Tantardini, Carlo Salerio, Egidio Biffi as well as Leopoldo Pastori and Mgr Aristide Pirovano. Worthy of mention is cause of beatification of his parents, Rosetta Franzi (1902-1934) and Giovanni Gheddo (1900-1942), spearheaded in 2006 by Mgr Enrico Masseroni, bishop of Vercelli. After overcoming some obstacles, including the fact that a son cannot take up the cause of beatification of his parents, the new archbishop of Vercelli, Marco Arnolfo, restarted the cause in 2015, appointing a new postulator, lawyer Lia Lafronte. Fr Gheddo’s books on his parents, Il testament del capitano (The Captain's Testament) with the letters of Pope John from the war in Russia (San Paolo, 2002) and Questi santi genitori (These Holy Parents) (San Paolo, 2005) have become best sellers, popular reading in many families. Starting in 2014, the ailing Fr Gheddo needed constant medical care. For this reason, he moved to the Ambrosiana nursing home in Cesano Boscone, in the diocese of Milan. Here he worked almost until the end, managing his blog and sending thoughts and reflections about the mission (see the one published yesterday in Italian by AsiaNews, on his long-time secretary Sr Franca Nava).